I’ve written and rewritten the beginning of this blog post so many times. Sometimes I wish you could just put feelings into blogs because words and pictures cannot convey the feelings that I want to express about this wedding. I really love when weddings are just about the love. Saturday’s wedding was nothing but a big love fest. 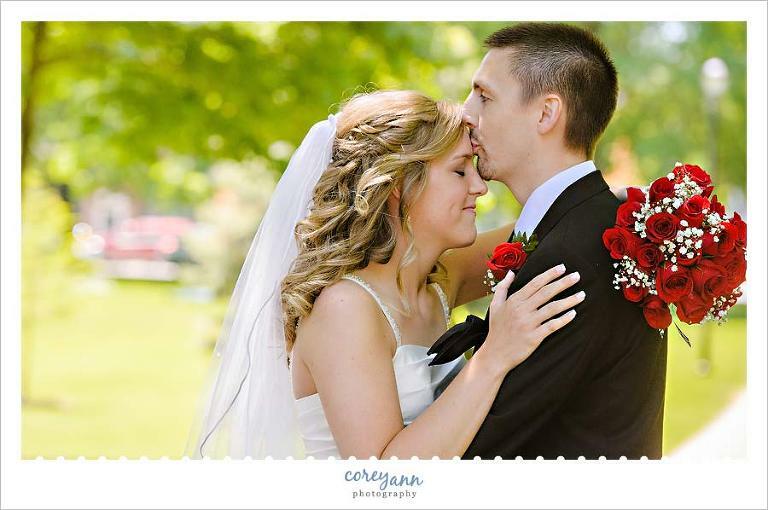 Not only between Stephanie and Jay but between their families, friends and even vendors. I was one of the few vendors (if not the only?) that wasn’t a close friend or family member and sometimes that can be kind of awkward feeling – almost like you are an interloper. However on Saturday I never once felt like I was an outsider. From the moment I arrived and got a hug from Stephanie’s Mom because she was so excited to meet me, to the moment I left when Jay’s Mom gave me a hug goodbye – I felt like part of the family. After we took pictures before the ceremony (yay for first looks!) they had lunch and made sure that I ate aas well, which is always a fun bonus! I loved how tightly woven family was into the day because their love for Stephanie and Jay is just as much a part of the celebration as their love for each other. Stephanie’s Dad even took part of the officiating and that always makes me smile when parents marry their children. There’s just something so wonderful about that! Stephanie and Jay made my day so easy. They were crazy easy going about everything and let me take the lead when it came to their portrait time. I took Stephanie’s dress and shoes outside for a photo shoot when I couldn’t find the right place inside and Stephanie didn’t bat an eye. Even when the Best Man pulled an epic prank on them during the ceremony, they both just laughed – they never showed a bit of stress during the day and that is how you get married. No matter what, you are getting MARRIED – the rest of the stuff? It’s just details. Thank you all for making the day so wonderful for me. I loved working with you! 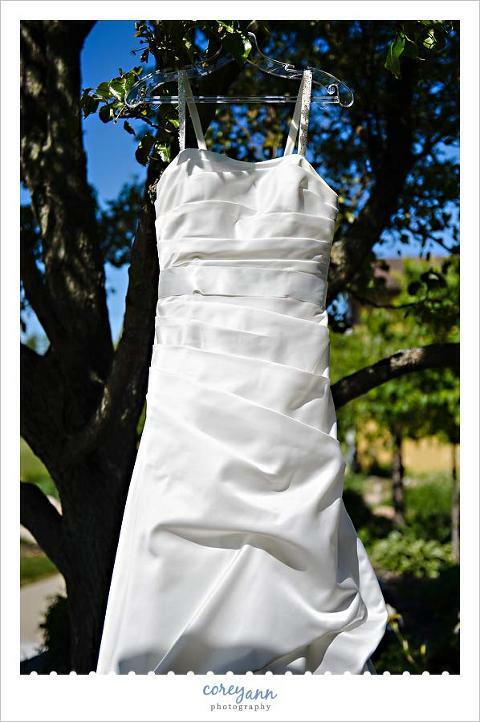 I loved that Stephanie bought her dress straight off the rack and it barely needed any altering! That’s SO rare!! 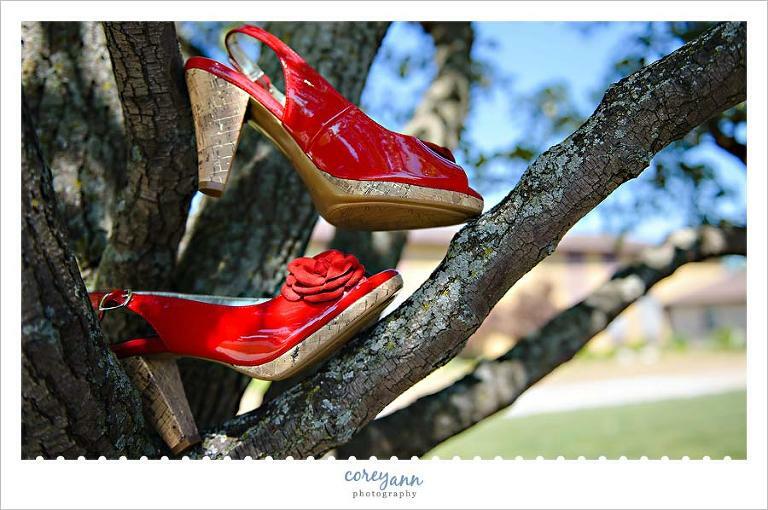 I adored Stephanie’s shoes so they got their own moment in the spotlight as well. This is by far my favorite image of the day! The Thank You sign may be an Oberlin tradition, started with Amanda and Matt a couple years ago. The whole bridal party. The kids may have been my favorite. These guys are too cool for school! Another one of Stephanie’s Mom’s signs and I love how it turned out! Yet another favorite from the day. When walking back to the square we came across this aisle of lanterns and I couldn’t pass them up without a picture! After pictures Stephanie got a makeup and hair refresh before the ceremony started and I love this pic of her feet! This may be one of my favorite pics of a flower girl ever. Stephanie’s laugh is just awesome. SUCH a dramatically lit ceremony! Oh, my friend has it in the audience… toss it here! Notice where the ring box is in the picture? Ha! Just kidding! Notice that there is NO freak outs from the bride or groom! They are just that awesome. This cake was beyond amazing. The cake was made by the Bride’s Aunt and while she’s made a lot of cakes it was her first major wedding cake! Just STUNNED! Instead of banging your silverware on glass to get the couple to kiss, these guys made you work for them to kiss and it ended up in a lot of laughs and lots of smooches! Here’s the Flower Girl and Ring Bearer ordering “The Charade” from the menu. Since it was still light outside I was able to take the rings outside to get some gorgeous pics of them, yay! I love the face Stephanie is making, you can tell she didn’t want to mess the cake up! The tossing of the bouquet! Finally, the exit after they changed. I loved that I got to shoot a “traditional” exit as we don’t see many of these in the North (it’s more of a Southern tradition). I loooooved the use of champagne poppers to shower them with! 5 weeks after the wedding and this blog just brings happy tears, thank you so much for all you did that day and how you captured memories for all of us! Everyone just loved you! Love! Thanks for being so easy to work with! It was sooo fun!